In the first Global Internet Phenomena Report in 2011, file sharing was huge on fixed networks and tiny on mobile. 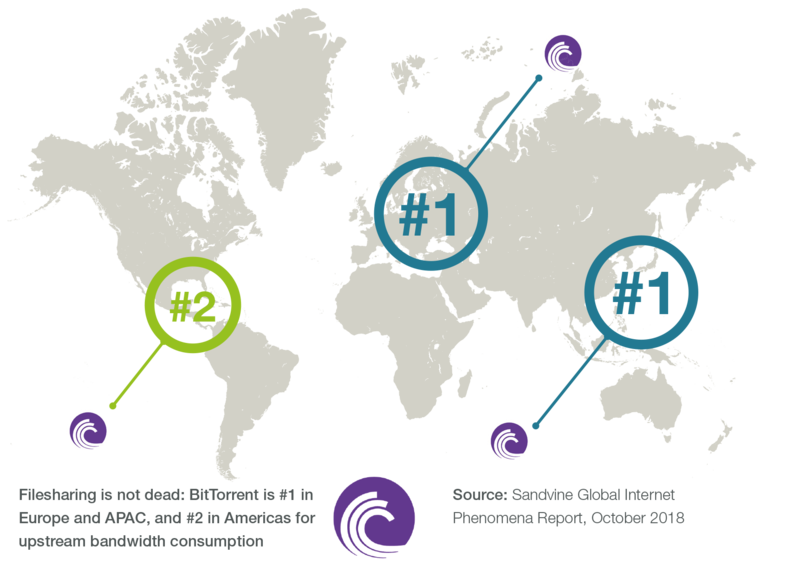 In the Americas, for example, 52.01% of upstream traffic on fixed networks and 3.83% of all upstream mobile traffic was BitTorrent. In Europe, it was even more, with 59.68% of upstream on fixed and 17.03% on mobile. By 2015, those numbers had fallen significantly, with Americas being 26.83% on the upstream and Europe being 21.08% on just fixed networks. During the intervening year, traffic volume has grown drastically on the upstream, with more social sharing, video streaming, OTT messaging, and even gaming on it. That trend appears to be reversing, especially outside of the Americas. In this edition of the Phenomena report, we will reveal how file sharing is back. More sources than ever are producing "exclusive" content available on a single streaming or broadcast service – think Game of Thrones for HBO, House of Cards for Netflix, The Handmaid's Tale for Hulu, or Jack Ryan for Amazon. To get access to all of these services, it gets very expensive for a consumer, so they subscribe to one or two and pirate the rest. Many of these exclusive series are US-based, and do not have good distribution internationally, so people download it because they have no access to the content. Game of Thrones is so popular that, unless it premieres at the exact same time worldwide, people will download it the moment it's available from anywhere. Since these numbers were taken in June for this edition, there were no Game of Thrones episodes coming out, so consider these numbers depressed from peak! More insights are coming this week on the report as we lead up to our report release and webinar update on October 2nd. By registering for our 2018 Global Internet Phenomena webinar, we'll send the report to you right when it comes out.